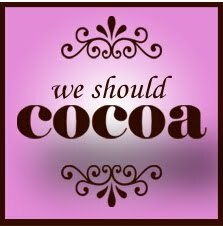 I'm feeling a bit embarrassed by my entry for We should Cocoa this month. I've just been to visit A little bit of heaven on a plate and seen the glorious entry that Sue has made and mine looks a bit pedestrian by comparison! You see the challenge this month is to make something that includes chocolate and green, I found that even more difficult than the savoury and chocolate challenge of last month. However, I came up with a solution of sorts. 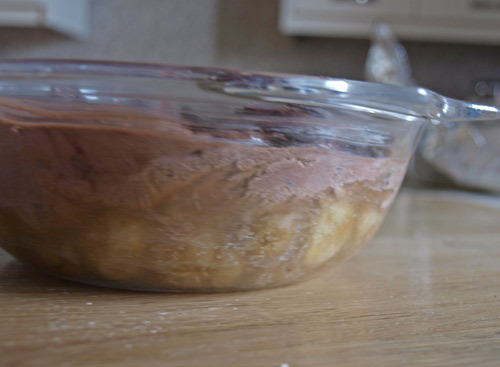 Put all the ingredients into a bowl and beat until combined, put on top of your cooked gooseberries and drop the pieces of chocolate into the batter. Bake in the oven at 180C for about 30-40 minute until the sponge is well risen and the fruit is bubbling. This is quite a high proportion of baking powder to dry ingredients (it was a mistake) but it made for a very light and airy sponge which wasn't too sweet. It would easily serve 3-4 people, if you have more fruit then double up the ingredients and use about 500g fruit. and just to show that it is green(ish), here is a side shot of the gooseberries with the uncooked chocolate sponge mix on top. Not my most elegant of recipes, but I didn't see anyone refuse to eat it! I wouldn't turn it down, no siree! 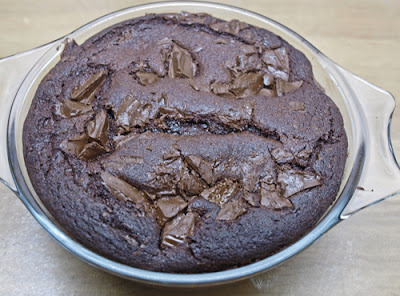 Love it, especially with those big chunks of chocolate. Pass the custard!!! I would eat anything that has added cocoa or chocolate. :D Yours looks delicious. nice idea using gooseberries as the something green! I love the tartness of those little green berries! Well done Janice, I couldn't even come up with one idea this month for WSC! LOVELY looking pudding! I've never thought of combining chocolate and gooseberries, but can imagine it actually works well with the sweet chocolate and sharp fruit. Delicious! Janice, this is a brilliant green theme and the only one as far as I know that used gooseberries so ten out of ten for originality. and it sounds very tasty too. Thanks for entering.